Franklin Templeton* surveyed one thousand Americans in 2010, 2011, and 2012 and asked them how the stock market finished at the end of the previous year. Roughly half of the respondents for each survey answered that the stock market was down or flat. Actually, according to Morningstar®, the S&P 500 had annual returns of 26.5%, 15.1,% and 2.1% for the years 2009, 2010, and 2011. So why did half the people surveyed perceive that the market was down or flat? The answer lies in the events of 2008. 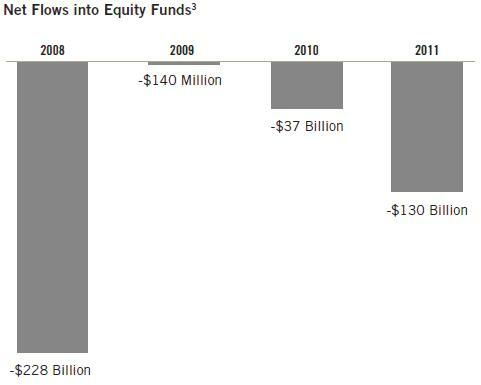 All of the negativity surrounding the financial crisis and a loss of 37% for the S&P 500 in 2008 caused many investors to move their money to the sidelines. In fact, investors continued to pull their money from stock mutual funds in each of the last 3 years, in spite of positive returns. If hind sight is 20/20, then you can see that the market is recovering from this most recent decline, just as is has in the past from others (see my August blog post). The best way to handle market volatility is to take no more risk in equity investments than you need to accomplish your long-term goals. Sit down with an advisor who understands where you want to be in the future. An expert that helps you take the emotion out of investing can be your greatest asset and help you to ride the bull without being afraid of the bear.